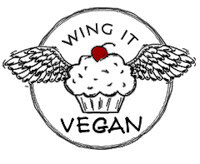 Wing It Vegan: Halloweegan Coasters and Napkin Rings! 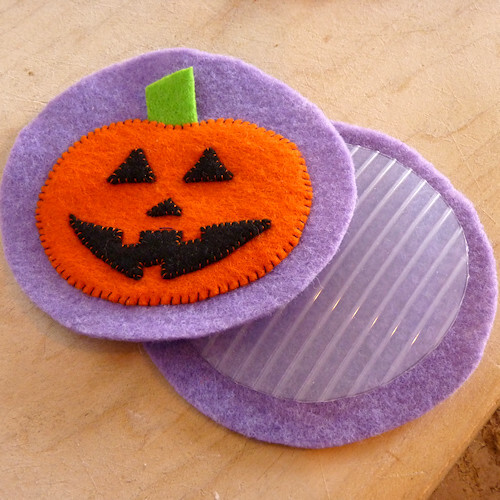 Halloweegan Coasters and Napkin Rings! OK. After this I'm all Halloween-crafted out! 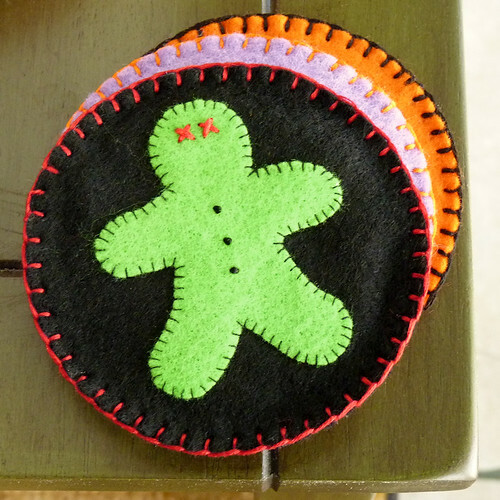 These felt coasters are very easy to make, but if you're a little obsessed with neat stitches it can be very time consuming. But then again there's always felt glue which would make these the speediest coasters ever! 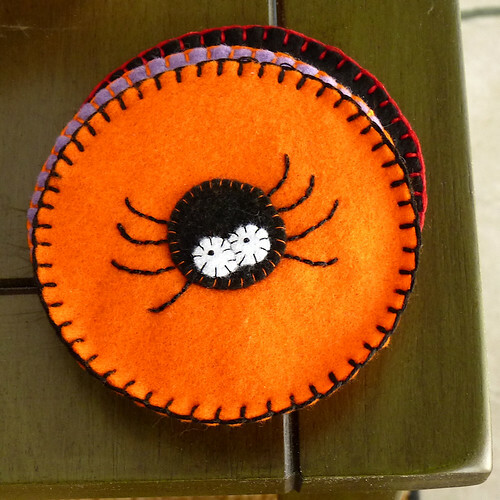 Little characters, small circle for plastic lining, big circle for felt. You will also need some sort of plastic sheet to sandwich between two felt pieces, or else your coasters won't be very effective. We're striving for impermeability here! I used some leftover cupboard liners that I had stashed away "just in case." See? It pays to be a pack-rat! 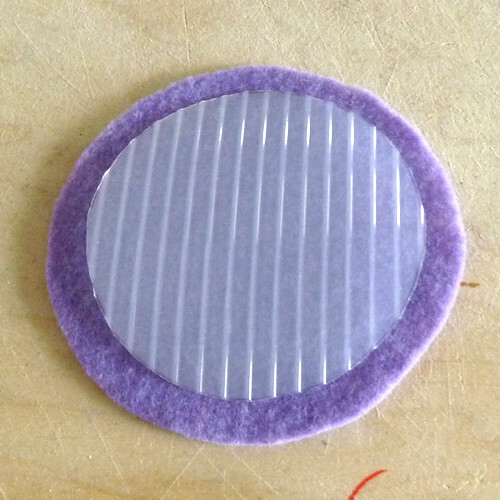 Anyway, you will need six plastic circles (the smaller circle) - one per coaster. Make a sandwich! 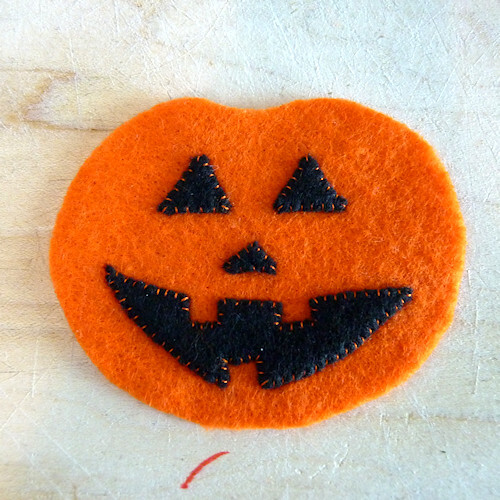 Take a felt circle, place a plastic circle on top of it, and a dolled up felt circle on top of the plastic circle. 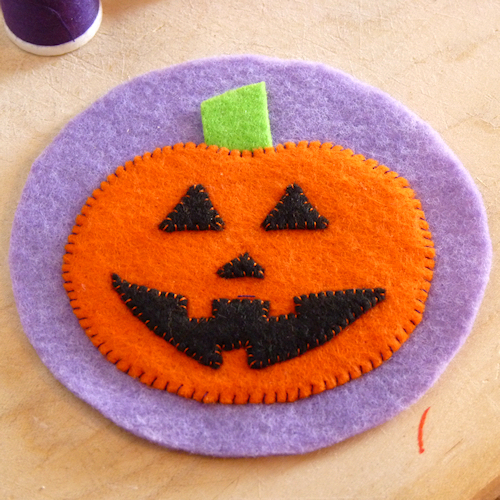 Now blanket-stitch with colorful floss all around to secure the plastic between the two pieces of felt and you're done! I also made some batty napkin rings from this site. Super easy and cute! If I had some red beads I would have given them creepy beady eyes. 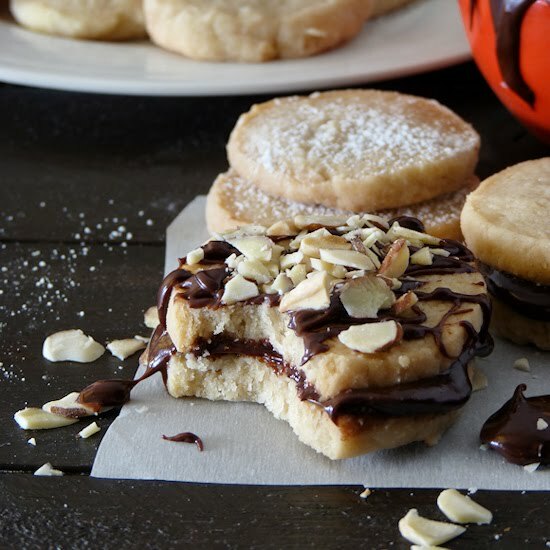 Do I have time to make some of these before Sunday?? Probably not (*slowpoke sewer*), but there is always next year! I love them! I like frankenstein the best! you are such a talent! You are so clever. These are the cutest coasters. So cute in fact, I'd be afraid to let anyone use them! All kinds of Halloween cute! I can't decide which is my favourite. First I was like "Oh the cat one is my fave" and then it was "Oh no Frankie is the best" and then I saw the Pumpkins and that's when I passed out from awesome overload. the halloweegan coaster scream cuteness from all angles, River! you are too sweet to take the time to post instructions for us as well. 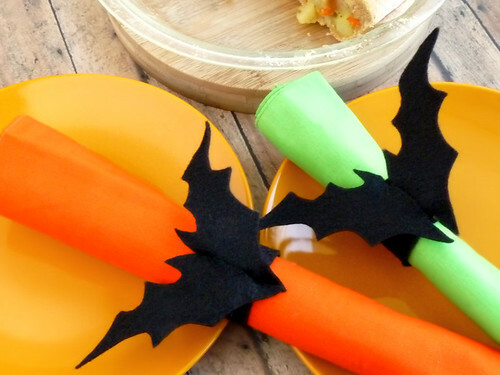 the batty napkin rings are my favorite - i think it's 'cause bats are my favoritest of animals. w00t! and i too am curious as to what you've got go'n on the napkin shot. something yummers, i bet! Okay, TOO cute. You've outdone yourself! Woah, so cute & so awesome! 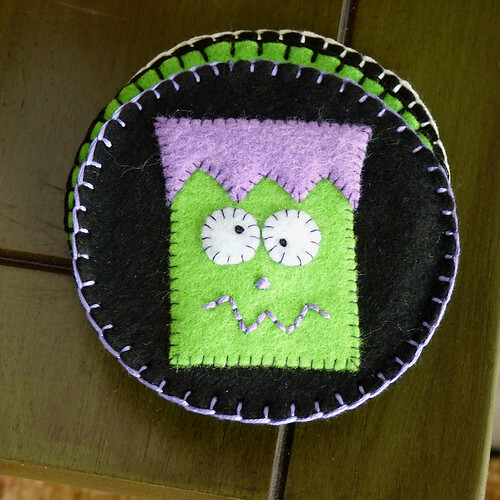 This is perhaps a ridiculous comment, but I love the blanket stitch! 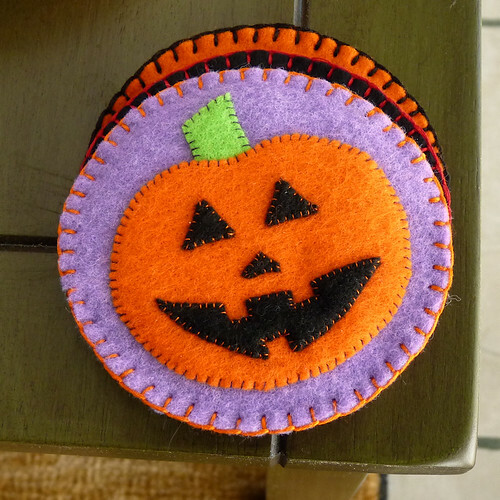 I just made a felt bag to go along with my daughter's Halloween costume and it was the first time I used blanket stitch. 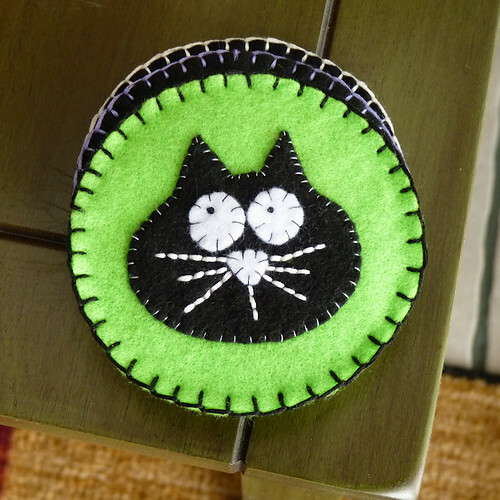 It's so fun and it looks adorable - as do all of your coasters! Crafted out?! No, say it ain't so! You are so cleaver and crafty! I would just do a set of kitty-faces! Thanks for sharing your template with us too. So adorable! I wish I had your crafting skills! No way, these are too awesome and adorable all at once! Oh, I do miss crafting... I haven't knit or crocheted or sewn in MONTHS and it's killing me. Thanks for the reminder, I need to clear out time to do so. I just wish I had more time to make these for Halloween! I love it!!! 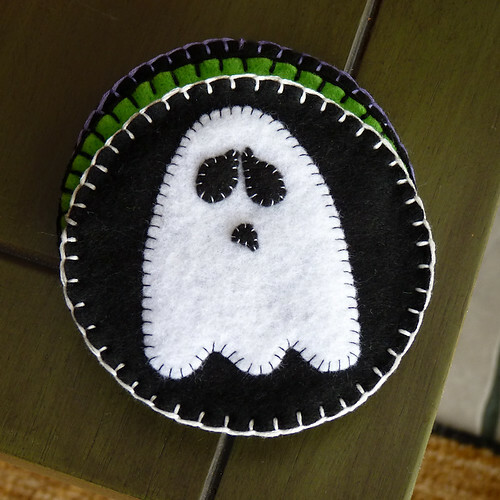 I made some winter coasters last year, but it didn't even occur to me to make Halloween ones! Brilliant idea! 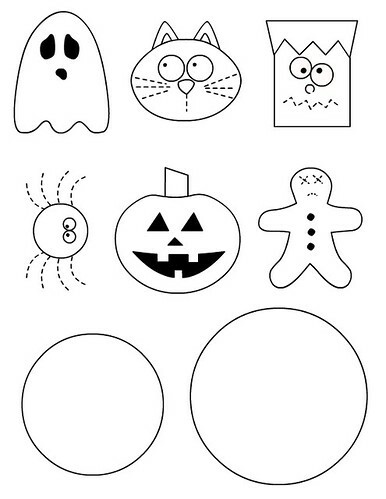 These will be made for next year's Halloween madness! river, you are just amazing. I love love love love love your halloweegan posts and these coasters are extra awesome. you rule! Can't believe I only just found those... SQUEEE! You made my day! I think the Frankenstein one is the best!